Taking care of your vehicle can be a lot of work. From knowing when to get your tires rotated to knowing what type of service fluid to use, it can be stressful. 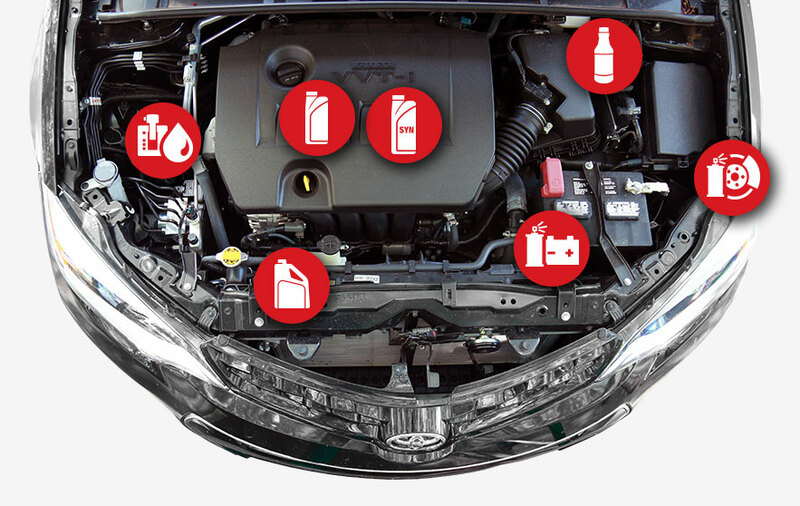 Because all of us at Toyota Place understand just how frustrating this can be, we have supplied the vital information that you may need to know when it comes to service fluids. With the information provided below, you have everything that you need to keep you moving. Where Do Your Fluids Go? This is an extremely durable formula that provides maximum protection without the use of harmful silicates. It is compatible with non-metallic materials to help extend the life of water pump seals. Additionally, it won’t corrode aluminum surfaces like coolants that contain borate and it is also compatible with Toyota Red Long Life Antifreeze/Coolant. Available in 5W-30, 10W-30 and 10W-40 grades, this motor oil helps protect metal and gasket surfaces from corrosion, prevents foaming and maintains the proper application of oil on cylinder walls. This motor oil improves fuel economy, improves thermal stability and provides longer oil change intervals. Because many new Toyota models are certified for a new, zero weight synthetic lubrication standard, this oil pumps better when cold. It also provides more uniform lubrication and overall efficiency than conventional engine oil. When your brakes start to squeal and chatter, brake cleaner is an effective, non-chlorinated formula that removes brake fluid, grease, oil and other contaminants without leaving residue. Great to use on batteries, terminals, cables and brackets, this is a unique formula that contains a cleaner, acid detector, neutralizer and protector all in one spray can. It penetrates and emulsifies dirt, grease and deposit, and it turns from light red to blue in the presence of acid. When you need quiet operation and smooth shifting in non-sealed Toyota automatic transmissions, automatic transmission fluid offers excellent lubrication characteristics, extends the transmission life and provides excellent drivability. Used to help provide superior performance in all Toyota brake systems where DOT 3 brake fluid is recommended, this is a super heavy-duty, high-temperature brake fluid designed by Toyota engineers. 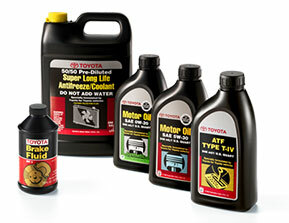 Should you ever need one of these service fluids or have any questions, make sure to stop by Toyota Place, where we offer great prices and specials on all service fluids. Our highly trained staff are more than happy to help and we look forward to serving customers from Garden Grove, Westminster and Anaheim.